During the Civil War, Waterbury Button Company made uniform buttons for both the Union and the Confederate forces The Union buttons were sold and delivered directly. The Confederate buttons were sold to British intermediaries and delivered by blockade runners. Waterbury Button has faithfully reproduced 6 of the original button styles for each army. 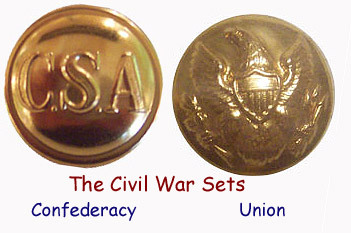 Please click on the "CSA" button for the Confederate series and the Union Eagle button for the Union series.